McDonnell Douglas and the National Aeronautics and Space Administration (NASA) have developed a tailless research aircraft that could dramatically change the design of future stealthy fighters. Named the X-36, the vehicle has no vertical or horizontal tails and uses new split ailerons to provide yaw (left and right) and pitch (up and down) directional control. This innovative design promises to reduce weight, drag and radar signature and increase range, maneuverability and survivability of future fighter aircraft. 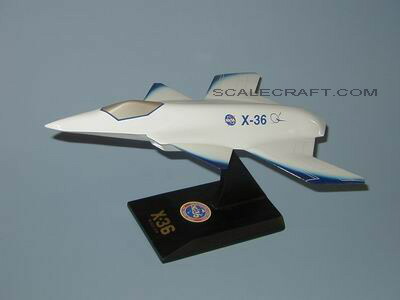 The X-36 was expected to be more maneuverable and agile than today's fighters. The tailless design reduces the weight, drag and radar cross section typically associated with traditional fighter aircraft. Solid Resin. Scale: 1/15. Wingspan 8 3/4 inches, Length 13 3/8 inches.